2313-Villamare-PREISE ALL-INCLUSIVE! Gratis Tennis / Pickleball - neu renoviert! Der Villamare Komplex verfügt über einen Health Club, einen saisonal beheizten Pool am Meer, einen Kinderpool und eine Whirlpool-Badewanne am Meer. NEUE RENOVIERUNGEN IN VILLA FÜR 2018! Glatte Decken, neue geflieste Duschen, Vinyl-Dielen, Zierleisten, neue Möbel und frisch gestrichen. 2313 Villamare ist ein 3. Stock, 2 Schlafzimmer / 2 Bad, NICHTRAUCHER, Oceanside-Einheit, mit Blick über den wunderschön gestalteten, lagunenorientierten Innenhof, auf den Ozean hinaus. Es bietet absolute Privatsphäre für Urlaub Paare oder Eltern, die einige Zeit benötigen, während ihre Kinder ihre eigenen individuellen Suite genießen. Das Schlafzimmer-Suite enthält ein Doppelbett und ein Full-Size-Bett, 42 "Flachbild-HDTV, Blu-ray DVD, CD / AM-FM / Musikanlage, Telefon, Bad und Balkon. Das Schlafzimmer verfügt über ein Kingsize-Bett, 50 Flachbild-HDTV, Blu-ray-DVD-Player mit WLAN, ein eigenes Bad mit großer begehbarer Dusche, Ankleide, Badewanne, Telefon und Zugang zum Balkon. Das gemütliche Wohnzimmer verfügt über Sofa und Liebessitz, 55 "LED HDTV Blu-Ray DVD-Player, beide mit WLAN-Fähigkeit und Zugang zum Balkon. Der angrenzende Essbereich und eine voll ausgestattete Küche verfügt über Herd, Kühlschrank, Mikrowelle, Geschirrspüler, Entsorgung, Bügelbrett, Bügeleisen, Telefon mit Anrufbeantworter und alle Küchenutensilien. Das Gerät enthält ein voller Größe Waschmaschine und Trockner, Bettwäsche und Handtücher. Die Villa verfügt außerdem über einen bequemen KEYLESS ENTRY, der das Tragen von Schlüsseln, die Sie im Urlaub benötigen, sowie KOSTENLOSEN TÄGLICHEN TENNIS ODER PICKLEBALL, KOSTENLOSER DRAHTLOSER INTERNET-ZUGRIFF, KOSTENLOSES LÄNGERE DISTANZ-CALLING und RENTAL-RABATT durch AAA RIDING TIGERS überflüssig macht . Leider sind keine Haustiere erlaubt sind. I had conference to attend in Hilton Head and decided to take my family along. 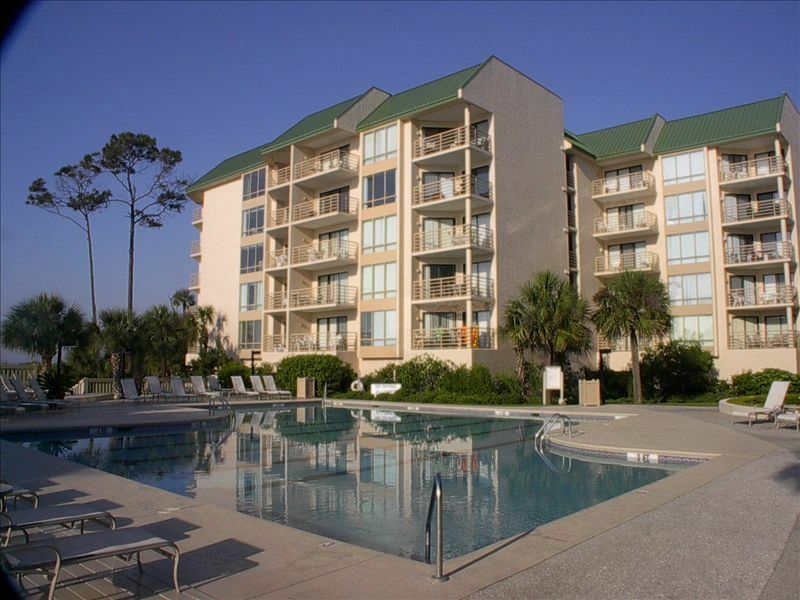 We were looking for something in Palmetto Dunes with close access to the beach and an indoor pool just in case of cool weather. We have rented many places in Hilton Head and beyond. This one stands out because the condo is so well taken care of and because of Ralph. Great communication. We were arriving the day after Hurricane Michael passed through and he helped to keep us up to date on any issues that we might encounter. One of our best VRBO experiences yet. We never did use the indoor pool though because the weather was spectacular. We had a wonderful experience at this condo! It is very well maintained and clean. The owner was very helpful and provided everything we needed. I would highly recommend staying here. Great location! The condo was very clean. We had plenty of room. I loved having a keyless entry because you didn’t have to worry about keys. Ralph was great! He responded quickly to any questions I had. The pool was wonderful with plenty of chairs. The beach and pool were a short walk from the condo. We loved playing pickle all! My family and I enjoyed kayaking in the canal around the condo area. Our only complaint would be that based on a couple of pictures on the internet, it looked like you could see the ocean from the condo. We had trees blocking most of the view. We did have a great view of the pond that had turtles and birds, so we enjoyed that. We would definitely go back! Villamare 2313 and Ralph are simply amazing. I'm going to keep this simply and not repeat everything that has already been said. My entire family rented 3 units in Villamare, even though all units were nice, 2313 was the best and when you include Ralph into the equation, it was amazing!!!!!!!!!!!! A huge THANK YOU to Ralph for making our family vacation, one to remember! Travis, it was my pleasure working with you and I am so happy that your first visit to HHI was an enjoyable experience for you and your family! I will try not to repeat what so many other reviews have raved about, other than to say that what others have said about Ralph and his condo are true! Amazing experience from beginning to end. The condo is fantastic, and Ralph was amazing to deal with! Some things others haven't mentioned that I really appreciate- nice DARK curtains in the bedrooms so that we weren't woken up by first light (I wake up easily by sunlight and this was a big plus! ), lots of towel racks and hooks, and very comfortable furniture. If you're ok not being right at the pool or beach there is a fabulous deck by the grills that has a wonderful view and is very peaceful and relaxing. Truly a wonderful vacation and can't wait to return! Our family of five (parents, two kids 7 and 10, plus grandma), stayed in Ralph's villa for a week in June. This was our first time in HH and won't be the last. All the previous glowing reviews of Ralph's villa were right on point. Ralph was a pleasure to work with from start to finish. He not only provided information on the villa, but also on HH itself, which was very useful for us newbies and helped us plan our stay. The villa itself was clean, roomy, well-appointed and located centrally on HH. We were no more than 10-15 minutes from pretty much everything on the island (favorite activities were a dolphin cruise with Dolphin Discoveries and kids loved interacting with critters at the Coastal Discovery Museum). The pool at Villamare is good-sized and only steps away from a fantastic beach that would give the Caribbean a run for its money. We went back and forth from pool to beach throughout the day. There are plenty of pool lounge chairs. The only thing in relatively short supply is shade. We flew, but if you drive in, bringing your own beach umbrella and/or beach chairs is recommended (chair rentals on the beach can add up). All in all, a fantastic family vacation! Thank you, Ralph! All quoted rates are complete and INCLUDE THE 10% TAX and CLEANING FEE.